Just a quick update on Mac the ram and his recent flit into the Llama enclosure. They are all getting on really well, but the recent conundrum is how to stop him jumping up and knocking their feeders off the fence, so that he can get seconds at dinner time. I think I’ll have to separate him for meal times or just attach the feeders to the fence more securely. With this being the start of a new year, I always think it’s good to map out a few goals for the year ahead. You know the sort of thing, like new year resolutions, but things that are realistic and that you will stick with to achieve through the year. Well with this in mind, I decided that due to being pipped to the post in my year end diet challenge, I would continue along that same theme, but go the whole hog and exercise as well. People say to me, “You don’t need to exercise, because you are outside working anyway”, but I do! Prior to moving out to the country, I used to regularly go running every week day, but have only ever been running maybe 3 times since we moved in here. So, I’m back on it with a vengeance and hopefully it’ll pay dividends over time. 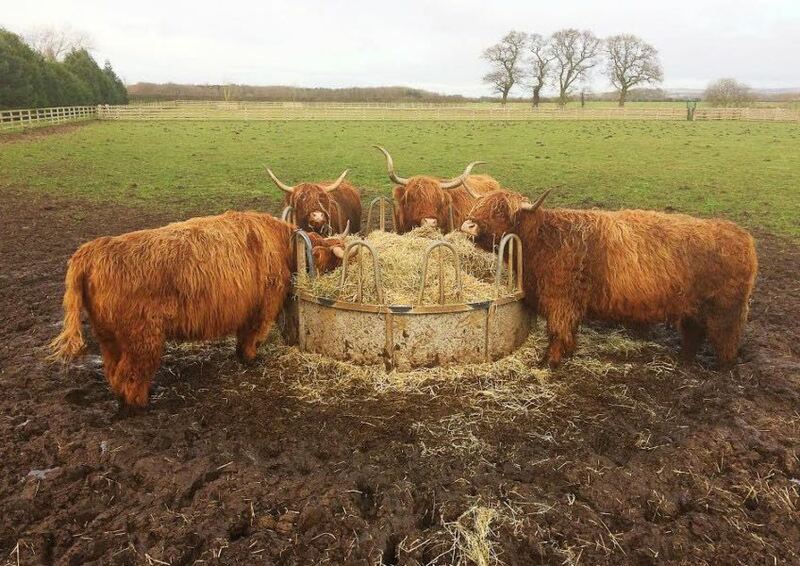 I was recently out with the Highlands when I noticed that the 3 younger cows had wet back ends, from the top of their backs, all the way back. Now, I knew that this wasn’t from them cleaning themselves up, as they wouldn’t be able to reach that far, with their tongue, so it flummoxed me a little and to be honest I was concerned. You see, I have seen this wet back end before and it isn’t a good sign. If any of them are in season, then the other cows would be attempting to climb up on their backs and therefore give them a wet back. If this was happening, then I could take it that any of them in season, wouldn’t in fact be pregnant and in calf. So, I did panic just a little in my head, when I caught sight of their backs and was cursing under my breath as I walked over for a closer look. It was Lyndsey and Flora, who I was concerned about a they were the ones who had been partying with the bull last summer and are hopefully in calf. As I got nearer, I carefully looked them up and down, but I couldn’t see anything which could tell me anything I didn’t already know, so still no answers. Then, as I was stroking Morag, it hit me like the proverbial bolt out of the blue. Well actually it was her tail that hit me and it was right across the kisser too! That’s when the penny dropped and the answer came to me. There I was, standing in the cow field with a muddy stripe right across my face, which stank too, I might add and it dawned on me that each of them are now eating hay from a feeder ring which is very muddy around it and with the mud and whatever else they care to drop in the vicinity, it’s quite a quagmire really. Their tail ends then drag in the mess and then throughout the day they swish their tails around their sides and as a result their back ends get wet…got it! What a relief that was, so I can continue hoping that we will get young ‘uns this year, fingers crossed! Living the Dream: Can I hear the patter of tiny hooves?